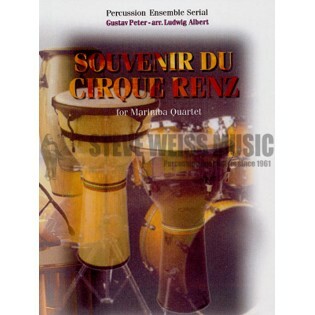 Souvenir Du Cirque Renz has been arranged for marimba quartet by Ludwig Albert. The original was composed by Hungarian composer Gustav Peter. Ludwig Albert has paired the Hungarian melody with a wide array accompaniment patterns and techniques for a full sounding varied arrangement. Internationally acclaimed, Ludwig Albert belongs with the top-flight of marimbists. After obtaining with greatest distinctions a First prize Percussion, the Superior Diploma and a Master degree specialization marimba at the Royal Conservatory of Music in Antwerp-Belgium, he was the first Belgian marimbist admitted to the Toho Gakuan Music School in Tokyo ,where he studied marimba specialization with Keiko Abe. Afterwards he performed with Abe on several concert tours.